I may have missed it.. but I couldn't find a thread about this. Just came across a preorder page for the new Matterport camera. Will there be any difference than the cameras we have at them moment? I doubt it. Surely they could not add more features that would not be available to us. That would be very bad form. Maybe some improvement in camera resolution or maybe just a marketing stunt? 4K support, higher resolution panorama's and GPS (for GSV I assume) according to that page. questions are will it be lighter or smaller size? how about the price? Great news !! Can't wait to receive the new one !! Allowing upgrade for previous MP owners is a good decesion of MP . It's only getting better !! I just got my camera 4 days ago... this is disappointing. That link - https://matterport.com/pro2-3d-camera/ - goes to the "old" camera, not the Pro2. @dtavres You should contact Matterport about returning it and pre-ordering the new one instead. Shouldn't be a problem. Especially with the return policy like you mentioned. They may let you use your current camera for the time being until the new version is ready to ship. You never know.. I'd just give them a call or send them an e-mail if I where you. Looking forward to seeing the response. The trade in allows you to get a refurbished pro 2 camera. Will there be an option to upgrade the hardware inside our existing camera's to the new spec's? I really do not want to put out another $5000 to $6000 Canadian to buy a new one, but would be willing to pay to get mine refurbished. My first camera ended up costing me about $9000 Canadian between the camera, shipping, duty and exchange rate. About 2 months later they started selling in Canada! Exchange rate is currently about 35% ouch! It is really good to see hardware improvement happened. 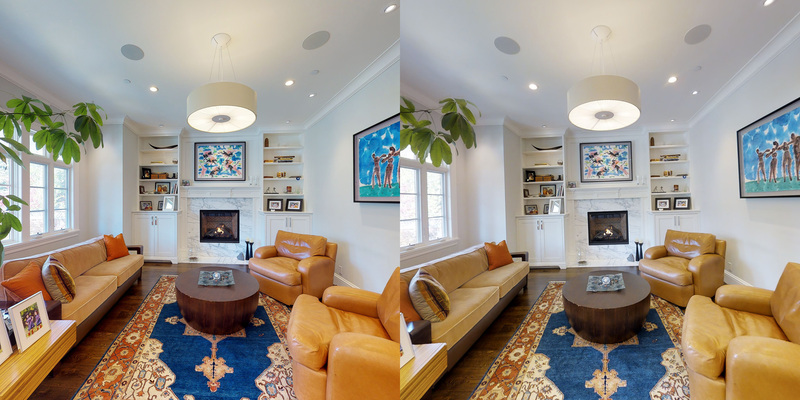 We generated two reports using our JuMP-ME v2.0 for the two compare showcase links provided by Matterport on their page. You can download two report PDF files, with them you can compare the result easier. 1st PDF report for Pro camera result. 2nd PDF report for Pro2 camera result. Note: those PDF files are a little big because they include all snapshot photos. This is what their sites says. So looks like we will have to COUGH the full price. I agree with Helen they need to look after us. I have big work coming up and want to give my clients the best product. They have a section where you check your serial number. I purchased mine in September 2015. So what do I do with my old camera use it as a doorstop or donate it to a camera museum ? 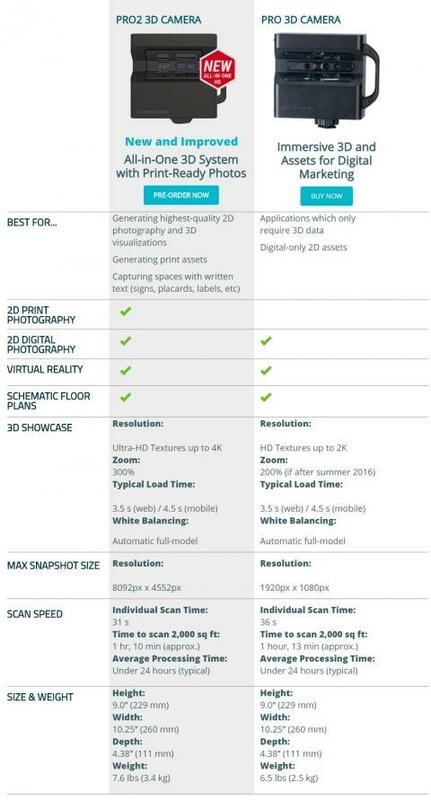 So yes Matterport I intend to buy the new camera , but you need to come to the party. There are new products coming to market that is also starting to look very attractive. Yes I know MP is still the best don't get me wrong. But then keep your customers happy and start giving us what we ask for on our Santa's Wishlist that is growing each year. Just like we want to give our clients the best end product, service and value for their money so must Matterport look at us. To estimate your expected trade-in credit, put your Camera Serial Number in the field to the right. @Gerhard Ya a $9000 door stop in one year is a little to much for me, I only bought it last February(2016). @Helen well I will email them and take this up with Support. I hope they can upgrade us. Like i mentioned I have big work coming up and shipping the camera to the US will take time , time = MONEY . No camera no work. I just find it funny that they did not send out a newsletter announcing this ? But I looked at the quality and it is a major improvement in will work great when we edit it into out 4K videos that we are producing for our clients. And the images don’t need that much editing , only the outdoors still. So I think all the members here must mail support and see what we can do as a collective group. More power in numbers. PURCHASE BEFORE DECEMBER 1ST, 2016? Your camera may not be eligible for trade-in, but we still want to reward you for being an early adopter of Matterport. Call your rep and order before June 30th, 2017 to get $200 off your Pro2 Camera. By the looks of the image below it seems like the improvements are mainly in the image quality. The new camera appears to be 5 seconds faster on each sweep, but is a lot heavier though. Will probably be expensive to ship..
By the looks of it no improvements for the 3D data, so I myself won't be upgrading anytime soon (unless the 3D data will be improved after all), since I use mine mainly for AEC projects. Hi, i really think its more a firmware updated version. just send me one i open it up and tell you everything about it. like i did with the first pro. MP added a extra GPS piece of hardware. I cant explaine the extra weight of almost 1 kilo. Maybe bigger batteries. There is nothing inside the camera that rises the weight by 1 kilo. So thats interesting. Housing is the same. bigger motor not neccesairy. With the "old" pro the pic quality wasn't that bad and you could also print the pics. After being processed. This probebly is changed now and you directly print the image from your Ipad. If this is so then i hope that its posdible to control shutterspeed, apparture and white balance. And not let the camera make these dissisions. Lets attent to the webinare to find out if its really a step up. 6 cameras to date, all under 2016. Matterport to me is now dead. How do I access my high resolution 4K photos? After receiving your Pro2 camera, use it to scan a space. Scanning takes about an hour for a 2000 ft2 house. After you upload it to Matterport Cloud, log into my.matterport.com, take a few snapshots through our web tool called Workshop, and download them to your computer. Now you can use them however you like! So no printing from iPad or settings for images , they are still going backwards even if they are moving forward. None of my three cameras qualify. Such bull and once again Matterport showing complete contempt to us professionals. They want to sell this thing to Agents, they DO NOT care about selling it to us. Agents barely want to pay for a model now. I fail to see how better resolution is going to swing it. 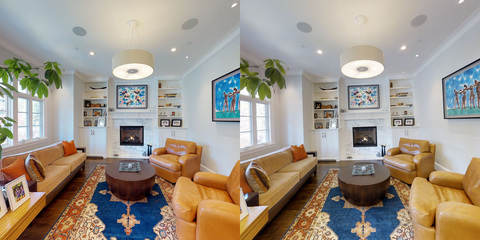 Will the new camera fix all of the insane stitching errors that exist in almost every model I see (light fixtures, railings, mirrors, etc.). You can't sell photos like that. Boo, hiss...done. @DannyBasting I´m still of the opinion that even with the "old" MP the could provide much better 3D data. Otherwise it would not be possible to deliver a better pointcloud-file. Nevertheless I think especially the early adaptors, we ordered 10/2015, should be better honored. $200 off is a joke. But let´s see what happens next weekend [at IRVPA in Vienna]. Maybe there are better options available from NC Tech. You don´t need a 3D scanning if you can create 3D out of HQ images. With the 3D data I was referring to the pointcloud. The pointcloud data from the current camera is great to work with, but could improve a lot on smaller objects. Not that I foresee this happening any time soon though. Enjoy your time in Vienna! Curious to hear about it when you return.